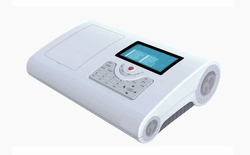 Range 190-1100 nm, basic/quantiative wavelength scan/DNA Protein Test/Kinetic, automatic peak picking & spectrum display. Large screen with graphic display. Spectrum and data can be printed out by printer and sent to computer via USB PORT. Set of 4 quartz and 4 glass cuvettes is provided. Software Included (Imported with German Lamps). 1. With colored screen.2. Feature of Dataout in Pan Drive. 3. Feature to run software alike Mobile App System, 4. Has heamamasthu Lamp and German Optics. 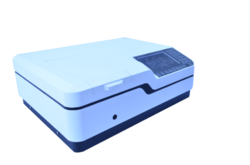 Variable Double Beam Spectrophotometer Device offered comes with wavelength range of 190-1100 nm (1200 Lines/mm grating) as well as Basic/Quantitative/Wavelength Scan/DNA Protein Test/Kinetics operational modes. For efficient performance, the system can deliver Fast / Medium / Slow scanning support as well as wavelength accuracy of +0.1 nm, bandwidth of 0.5, 1,2,4,5 and wavelength reproducibility of 0.1 nm. Some of the other standard features of this system include photometric repeatability of + 0.2 % T, baseline flatness of + 0.001 A, USB based data output port and parallel printer port among others. 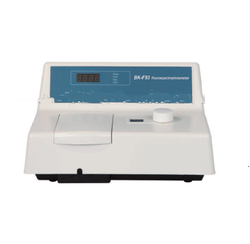 Microprocessor UV / VIS Spectrophotometer (Double Beam) 8 CELL HOLDER offered comes with wavelength range of 190-1100 nm Czerny Turner with spectral bandwidth of 1 nm and working mode in form of Basic/Quantitative/Wavelength Scan/DNA Protein Test/Kinetics (T,A,C). The system also features double beam (1200 lines/mm Grating) based optical system, scanning speed options of Fast / Medium / Slow, photometric range of -0.3 - 3.5 A, 0 to 220 %T as well as wavelength accuracy of +0.3 nm. Some of the other standard features of the system include wavelength reproducibility of < 0.10 nm as well as available support in form of software CD, USB Cable, operation manual among others. Fluorescence analysis is a highly sensitive and high selective sophisticated-analytical method.This method can provide information including-excitation and emission spectrum, emission light intensity and measurement of life of emission light and polarization fluorescence-etc. 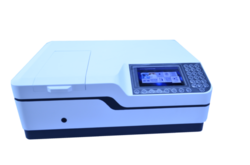 Microprocessor Double Beam UV-Vis spectrophotometer With advance circuit measurement and control system make the instrument with high realiability and low noise. Range 190-1100 nm, basic/quantative wavelength scan/DNA Protein Test/Kinetic, automatic peak picking & spectrum display. Large screen with graphic display. Spectrum and data can be printed out by printer and sent to computer via USB PORT. Packaging Details: EXPORT WORTHY - PACKED IN CARDBOARD.